Why I Picked This Book: I've seen it on so many "Best of" lists that I figured it was time to read it. My Impression: Going in I was expecting something Gothic-y and over the top and a super quick read. I think part of this was because I kept getting this confused with Woman in Black which is a very different story. No part of this book is a quick read and nothing really felt over the top though there is definitely something sinister lurking in the shadows. The story itself is gorgeously told. It's so richly done that I could only read a chapter or two at time without it becoming almost too much - like incredibly delicious chocolate cake where you can only have a few bites at a time. That being said this book stuck with me. Frequently when I'm reading a book a little at a time the story will lose its impact and I'll spend the first few pages trying to reengage with the story. That was not the case with this book. I was instantly pulled back into the story as soon as I started reading the first sentence and it was just like pressing play on a movie I had paused. The story and the characters were instantly alive and richly drawn. At one point I had to take a 2 week break (library book,, had to go out of town, etc) and the story stayed just as crisp in my mind as if it had only been minutes. This is definitely a plot driven story. Laura, Marian, Walter, Sir Percival and all the rest are clear in my mind but they weren't rounded out fully formed characters. They did serve as an excellent background for the larger the life Count Fosco and their backstories never got in the way of the story unfolding on the pages. I don't want to say too much about the plot itself because I think I enjoyed it more with no real expectations but it's definitely a slow burn novel. I thoroughly enjoyed the reading experience. The bit I read each night was like a delicious little treat to end my day with! Would I Read More of this Series/Author? : Absolutely! I love Collins' writing style and hope to read The Moonstone soon. Would I Recommend this Book? : I would! I think most readers would enjoy this though be prepared for it to take awhile! As much as I enjoyed The Woman in White, I thought The Moonstone was even better! I get this and the Woman in Black mixed up too. I haven't read either, though. I'm really glad you enjoyed this one. I need to get to The Moonstone too. I really enjoyed The Woman in White and am so glad you did too, Katherine. It really swept me up into the pages when I was reading it. I have had this on my TBR for forever. I'm going to nominate it for bookclub I think! Love your review of this book and that you savoured it by reading slowly. I admire you for picking it up and giving it a read. This is one classic that I do actually hope to read at some point in the future. I am so glad that you loved it. Great review! 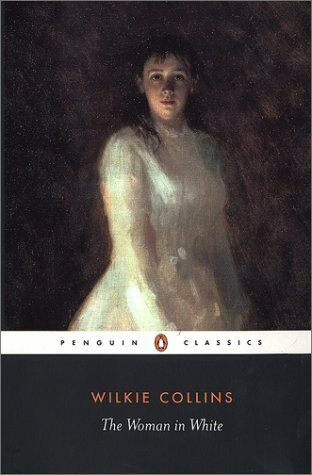 I recently reread The Moonstone and I think on the whole I prefer The Woman in White (however, my memory might be hazy, as I haven't reread it in a long time). I am so glad that you read The Woman in White. It has been on my list for years, and I have finally added it to a couple of this years goal lists, so I am hoping to follow through and read it myself, finally. It's good to see that you loved it. I kept thinking of the Woman in Black. I love that the story stayed with you. Fantastic review Katherine. I've not read this one but have heard about it. Thank you for the review. The Woman in White is one of those classics I've been meaning to read for the longest time. Seen as I'm trying to make more use of the library this year, I'll have to see if they carry it. Thanks for sharing your thoughts. It's a wonderful read - and once I surfaced from the storytelling, I was shocked at the double standards in place regarding men and women. I also enjoyed The Moonstone, but it is more of a mystery and faster paced than Woman in White. I'm glad you liked it:).